Sweet potatoes make a fairly frequent appearance at our dinner table. Baked (then slathered in butter and sprinkled with cinnamon/sugar) is one of our favorite ways. Also chopped and roasted with a mix of other vegetables. As a side note: the one way it does NOT appear on my table is mashed and mixed with tons of sugar and then topped with those little marshmallows. Ick! I know it is a Thanksgiving favorite for many people, just not me. This recipe we also really enjoy. I like it even more than the baked sweet potatoes. It is a savory presentation, but it comes with dip, and who doesn’t love dip! They end up crispy on the outside, but soft and sweet on the inside. Another thing I love: minimal clean-up. I mix the sliced potato wedges in a ziploc bag with olive oil and spices and have Little J toss them around a little (she LOVES mixing/squishing things in ziploc bags). Then pour onto a foil-lined baking sheet, arrange in a single layer, bake and serve. Just one not very messy baking sheet to wipe down. 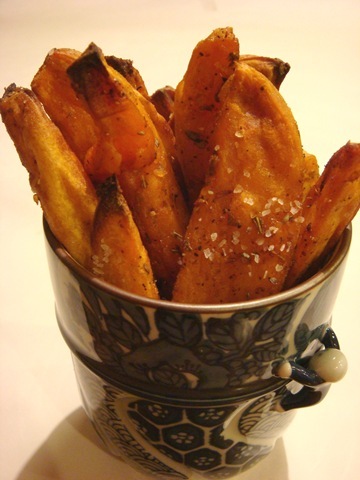 Sprinkle with a little coarse sea salt or kosher salt and serve with or without dip. We like to eat them with a cilantro yogurt dip. It makes a nice contrast with the natural sweetness of the potatoes. Mix potatoes, oil and seasonings in a Ziploc bag. Mix well. 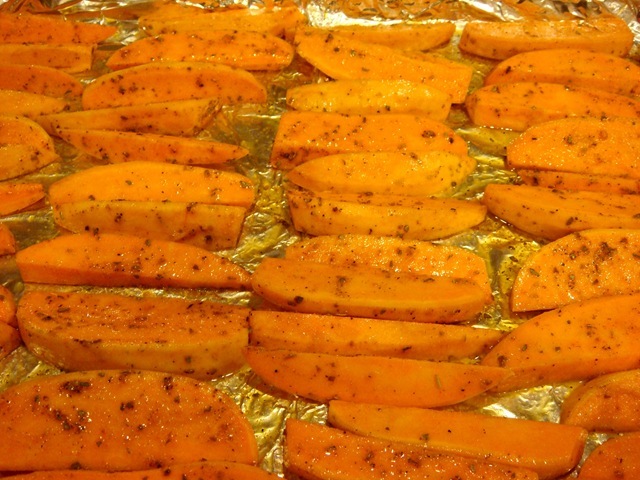 Spread onto a foil-lined baking sheet. Arrange potato wedges in a single layer. Bake at 375°F for 30-40 minutes, turning once. Sprinkle with additional coarse salt while hot. Serve with Cilantro Yogurt Dip, if desired. Mix all ingredients together. Chill 1-2 hours in refrigerator to blend flavors. Taste; adjust salt to taste. Serve. For a thicker dip: start with about 1 1/2 cups yogurt and strain in a cheesecloth-lined colander to remove excess whey from yogurt. 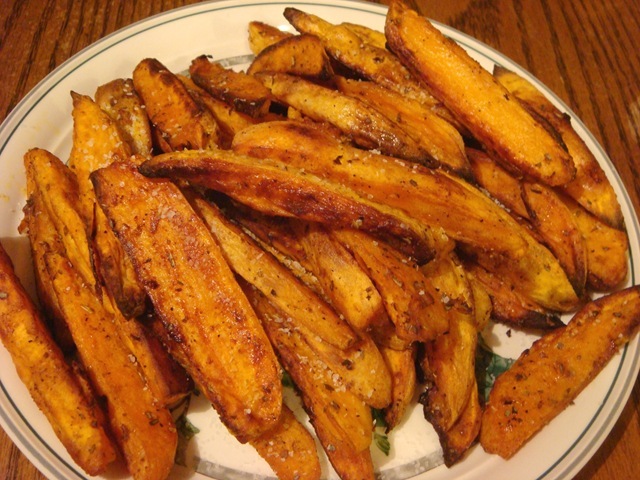 These look so good – I’ve done the sweet potato wedges with parmesan cheese, but not with the yogurt dip – can’t wait to try them that way. Thanks for sharing. These are soooo good! I could eat these everyday! Thanks for sharing this recipe. It’s nice to have a change from the sweetened version.